The liver is a vital organ located in the right upper portion of the abdomen beneath the diaphragm and rib cage. It is composed of four lobes and has a wide range of functions related to digestion. The most common injuries to the liver during sports participation are either a bruise (contusion) or a cut (laceration). Abdominal injuries are more common in contact or collision sports, such as football. Both the spleen and liver are the most commonly injured organs in blunt trauma. Athletes participating in contact sports are at an increased risk for liver injury. A direct hit to the organ is the most common cause of a liver injury. 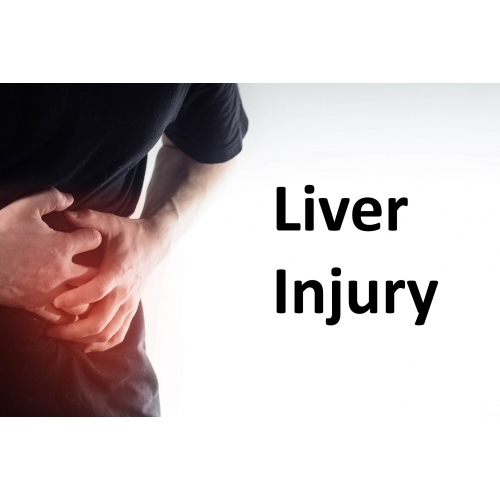 Signs and symptoms of liver injury can be subtle and therefore difficult to diagnose. Athletes may complain of nausea, vomiting or right-sided upper abdominal pain. This pain can spread to the right or left shoulder. They can come with bruising over the sides of the abdomen or around the umbilicus (belly button). During an evaluation, the athlete may experience palpitations (irregular heart beats) or low blood pressure due to pain or blood loss. A sports medicine physician will evaluate the athlete to determine the injury the athlete has sustained. The evaluation can include taking an athlete’s pulse, blood pressure and examining the abdomen. Diagnosis of a liver injury is confirmed with an imaging test called a CT (computerized tomography) scan. These injuries require admission to a hospital for continuous monitoring with blood tests and repeat pulse and blood pressure checks. In more serious cases, the athlete may require surgery. An early evaluation by a sports medicine physician is important to help identify possible life-threatening injuries. Wearing protective equipment while participating in contact sports may help prevent liver injury. The length of recovery depends on the severity of the injury. Simple liver lacerations may heal in 2 to 4 months. More serious lacerations may heal in up to 6 months. Depending on the severity of the injury and the symptoms, the athlete may need to have a CT scan repeated before returning to sports participation. Juyia, Rushad F. Return to play after liver and spleen trauma. Sports Health. 2014 May;6(3):239-45. Casiero, Deena C. Closed Liver Injury. Clin Sports Med. 2013 Apr;32(2):229-38.